Los Angeles County Sheriff’s Deputy Susan “Su” Vodrazka, a 28 year veteran on the Sheriff’s Department, was assigned to the Transit Services Bureau of the LA Sheriff’s Department. 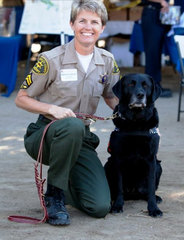 She would be the very first K9 handler assigned to the newly expanded bureau within the LA Sheriff’s Department. Deputy Vodrazka now handles Transportation Security Administration trained explosives detection K9’s, with her current partner Pluto. Deputy Vodrazka also works with the Human Remains Detection K9’s as a volunteer. Vodrazka works with her current Human Remains K9 partner, Riggs. She routinely receives calls from outside agencies during her off work hours to deploy one of her personally owned and trained K9’s to either rescue or recover someone in need of assistance, sometimes taking her to other states, hundreds of miles away, at a moment’s notice. She has deployed to natural disasters like the aftermaths of Hurricanes Katrina, Rita, Gustav, and Ike. She was also called to the massive mud slide that buried the town of Oso in the State of Washington. On June 14th, 2016, the Los Angeles City Fire Department called Deputy Vodrazka and asked if she would come to the Westlake District of Los Angeles, to assist in the recovery efforts. Several persons were still listed as missing in a large structure fire that the department had just been able to bring under control. With so many different scents emanating from the location, the decision was made to bring in several K9 teams to help search for bodies that might still be buried in the rubble. Working with a Los Angeles City Firefighter, a FEMA Task Force member, and their K9 partners, Deputy Vodrazka and Riggs were able to find 4 deceased persons and help to bring closure to their families. The task accomplished by these brave handlers was indeed heroic. The search conditions were extremely treacherous. The large structure that had been reduced to piles of still smoldering debris. 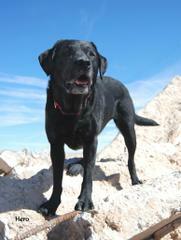 Yet, the Handlers and their K9 partners pressed on until they had searched the entire scene. 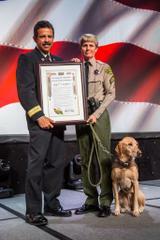 For their actions, the Handlers and their K9 partners received Special Recognition Awards given for outstanding service by the Los Angeles City Fire Department Foundation at an annual award luncheon held on September 29, 2016. Deputy Su Vodrazka, always one to shy away from the spotlight and accolades, can be seen almost daily with her newest K9 partner Pluto. Patrolling the Metro lines and riding Metro buses. Shaking hands and letting kids pet her partner. “I sometimes think it’s the part of the job that I like the most.” She says. The Transit Policing Division of the LA County Sheriff’s Department boasts 18 teams of handlers and their K9 partners that patrol the Metro system and Metrolink commuter trains.